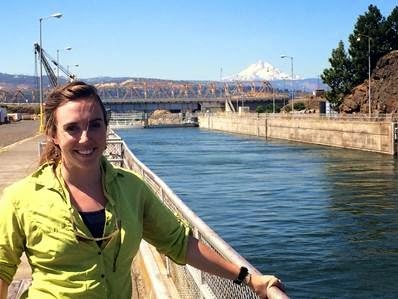 As the 2014 Knauss season wraps up, IISG-sponsored graduate student Katherine Touzinsky wrote in to update us on her work at the U.S. Army Corps of Engineers since we last heard from her in August. The last time I wrote for the IISG blog, I was overwhelmed with gratitude for how far the Knauss Fellowship had taken me—both figuratively through professional and personal development and literally by zig-zagging across the country. Since then, the travel and learning has not slowed down. I have eaten lunch on a dredging rig in the Gulf of Mexico, visited a research laboratory in Athens, Greece, attended a conference on deltas and climate change in the Netherlands, and explored the Everglades learning about the impending consequences of invasive species and climate change. The fellowship is now coming to a close, and the tides are changing at work. The open-ended learning ended a few months ago when I committed the majority of my time to a new and exciting project with the U.S. Army Corps of Engineers. Resilience is an ambiguous word that can mean different things depending on the case and application, but most definitions include four key aspects: prepare, resist, recover, and adapt. Because the Corps is in charge of the nation’s water resources infrastructure, there is a huge need to investigate these concepts and research the best way to apply resilience to Corps policy and practice. I have been offered the opportunity to assist with much of this initial research. While it is intimidating to face such a huge issue and figure out how to recommend solutions for such a huge and venerable organization like the Corps, I wake up every day excited to learn more. This coming February, we are working on a joint U.S. Army Corps and NOAA workshop to quantify resilience in Mobile Bay, AL. I will help test the method by working with community experts from the Mississippi-Alabama Sea Grant Consortium and the local port authorities to be vetted later this spring by the National Academy of Sciences Transportation Research Board. Despite all of this excitement, I know that my Master’s thesis is still waiting for me. Luckily, I have been given the opportunity to continue working in Washington D.C. at the Corps headquarter office and will work part-time on my thesis. I’m brainstorming possible locations to work on the thesis—it would be great to say that I wrote a chapter or two in the Library of Congress! The Knauss Fellowship has been an unbelievable opportunity that continues to unfold!